One of the fun things about trying foreign candy with no English writing on the package is that you have no idea what to expect from it. Sure, I could Google it if I could figure out what it’s called, but where is the fun in that? Today’s review is of three different flavors of sour hard gummi candy called Shigekix. 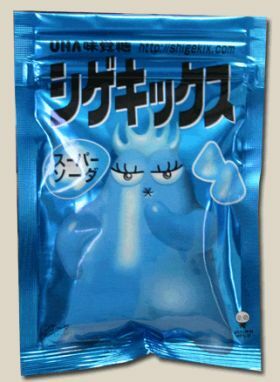 I had no idea what this candy was or even what would be inside the bags. All I knew was that each bag had a different, cute, colorful character on the front. 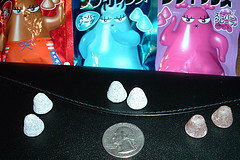 It turns out that Shigekix are small (see picture below for size) gumdrop-shaped (only smaller) hard gummi candies. I know, hard and gummi don’t seem to go together, but that is the best way to describe them. They are harder and chewier than your average gummi and after you chew on them a bit they soften up. Each one starts out with 10-15 seconds of a reallly sour kick and after that the sour diminishes and the real flavor comes out. Even though these are small, they last a while – most of them lasted about a minute, and some I could even make last two minutes if I really savored the flavor. Cola flavor! Oh yeah! I have mentioned before how I like cola-flavored candies, so I was excited to try this one. Unfortunately, I was a little disappointed in it. After 10-15 seconds of intense sour, the cola flavor starts to come out and while it was good, it was a bit too lemony for me and not cola-y enough. Still good, just not as good as I had hoped. I wasn’t sure what flavor this actually was at the time. It’s called Ramune and it is described with the words soda and lemon also. (Since trying them, I looked it up and found out what Ramune is – it’s essentially Japanese lemon-lime soda.) It had a heavy lemony/citrus flavor and seemed to have a very faint mint flavor in the background. This flavor packed the best beginning sour punch of the three and was my overall favorite of the three. The grape didn’t really have a big grape flavor to it – just a hint of grape with the sour/citrus. The grape flavor came out as I chewed and sucked on it, but it never really came out but was stuck behind the sour/citrus flavor. It also seemed to get much sweeter the more I stuck with it – sweeter than the other two. Overall, these were really fun candies to try. They are totally different than any candy I have had before. They start out sour and end up as a hard gummi. There are actually a few more flavors of Shigeki – I know there are lemon, melon, and peach and there may be more. Of the three I tried, I’d have to say I liked the Ramune flavor the best of the three, but they were all good and definitely worth trying. You can buy the shigekix @ Uwajimaya.